On a rainy night in New York City's Hell's Kitchen, a woman throws a doll from the fifth-floor window of a gutted tenement, then leaps herself. From his own apartment a few blocks away, freelance photographer David Corman listens to the radio reports as they come over his headset. Corman is a man at the edge, threatened with eviction, besieged by his wife's attempt to regain custody of their daughter, yet reluctant to give up the life that permits him to roam the night. In the woman's dying fall, he sees the chance to sell a story and perhaps buy some time. So he starts to probe deeper. Nothing prepares him for the odyssey he is about to undertake. As the path leads, dark and twisted, from the meanest streets of New York to the homes of the rich, he struggles to uncover the life of the woman who leaped into the rain. The more layers he strips away, however, the more puzzles confront him, until ultimately, the search turns back onto himself: the dead woman's true tale reveals shocking truths about his own life. At last, what began as a simple search for a story becomes a fight for his own soul. 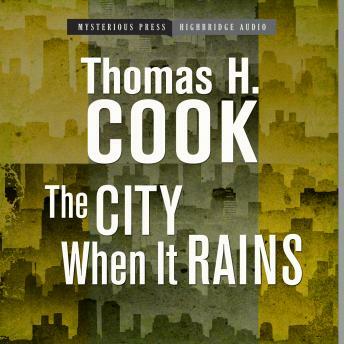 Rich in character, complex in plot, The City When It Rains is a haunting, suspenseful novel of uncommon force. Written with the stark beauty of the city it describes-passionate, resonant, a mystery in the deepest sense of the word.